With the accuracy of an Imperial Stormtrooper, and a name to match, Misfire has been one of my most anticipated pickups from Titans Return. 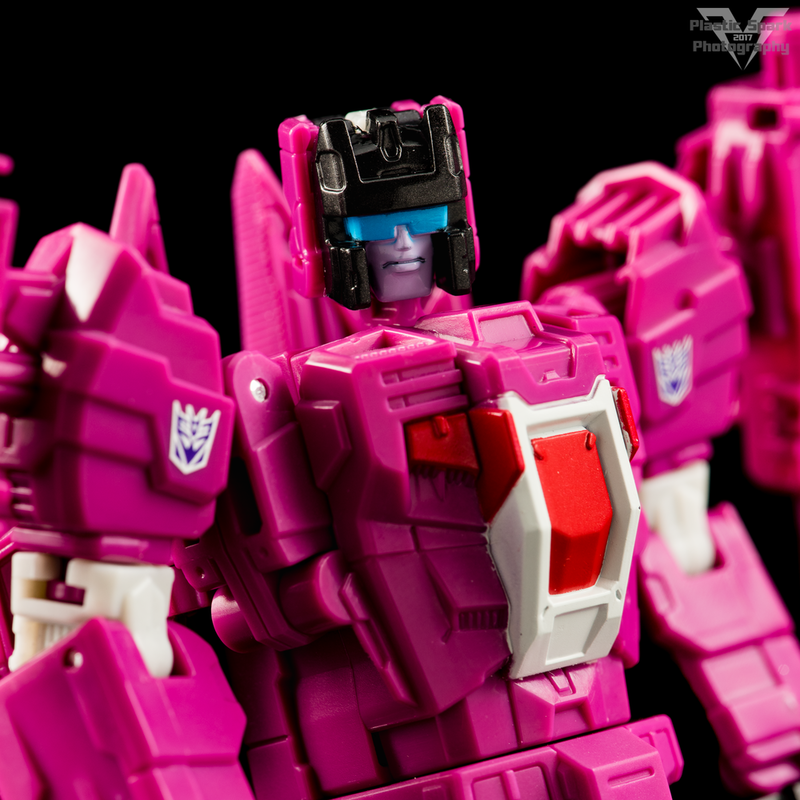 Originally a Targetmaster in the G1 glory days, Misfire has been converted into a Headmaster with his previous partner, Aimless, now becoming his noggin instead of his firearm! Let’s get a little bit of housekeeping out of the way here. I’ve seen a lot of talk in the community of Misfire being a retool of Triggerhappy. I even considered him as such myself until I got him in hand. While he shares some of the transformation engineering and lower legs of his fellow Decepticon Targetmaster, I feel pretty confident that Misfire does enough differently to be considered more of an original figure with some shared parts than a retool. 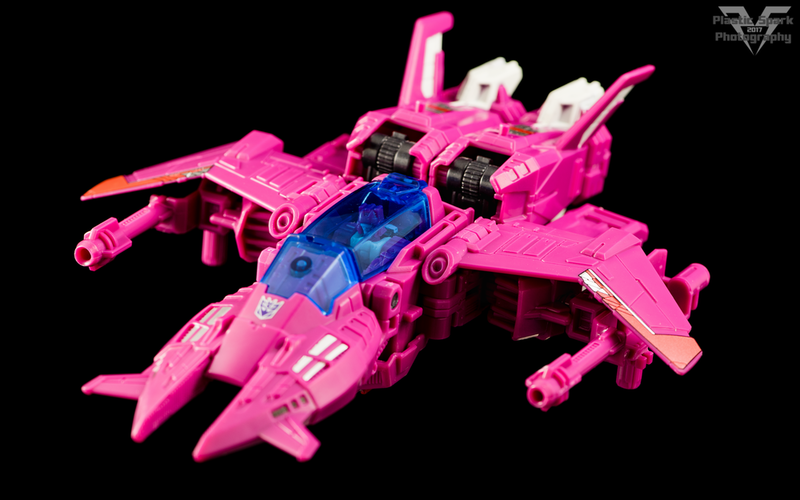 Misfires jet fighter mode is absolutely gorgeous. He has a few gaps in the rear, similar to Triggerhappy thanks to their shared legs. However I feel like he does a better job of managing his arms; even if I’m a moron and mis-transformed them in a lot of these pics. The whole jet mode is absolutely gorgeous with a ton of sculpted detail and a reasonable amount of paint for a main line deluxe figure. In particular I really love how the cockpit area turned out, with the translucent canopy, and a deep seating area that actually has Misfire posed in a seated position rather than laying back as many of the other Titan Masters do in their vehicles. Transformation is a simple and fun process that can be easily sorted without the need for instructions. The wings/arms in particular are really fun bit of puzzle play that I find enjoyable to deploy over and over. This has been one of my go to desk figures to fiddle with while I watch YouTube. 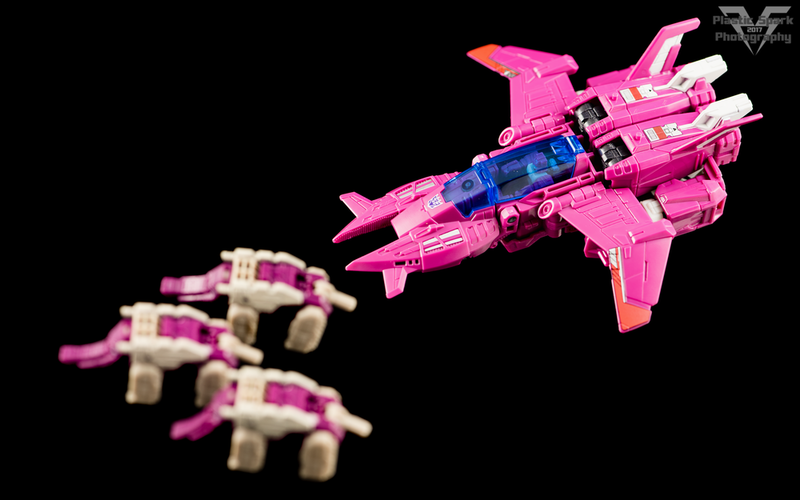 Misfire makes for a pretty cool looking Decepticon. The bright pink can be a bit overwhelming but I think there’s just enough off white detailing to break up the main sections. A little more detailing on the torso would be nice but this is Hasbro we’re talking about here, they’ve never been that generous with the paint. There’s a ton of sculpted detail for you awesome customizers in the community to work with though! I was very impressed to see that they actually painted the Titan Master this time! Articulation is pretty much identical to Triggerhappy, with the only real missed mark being the lack of wrist swivel which really seems to be an on again off again kind of situation with these Titans Return Deluxes. I really like how his silhouette turned out with the wings on his back, almost seeker like. In fact his whole bot mode design could probably work as an IDW style seeker with a bit of adjustment. You can even plug his weapons into his shoulders just like null rays! I really like that his weapons plug together and have the pegs on the bottom so you can sort of fake having a double barrel blaster on one hand instead of 2 incohesive blasters. I wish another Titan Master could convincingly be mounted in there but it doesn’t really work that well. 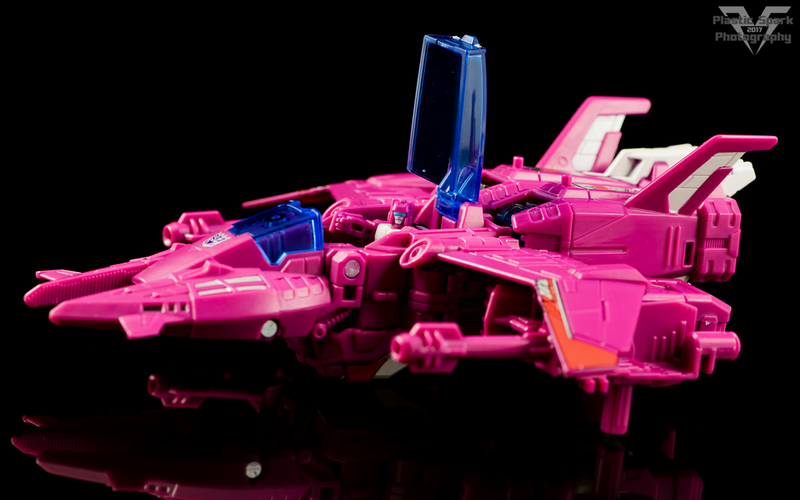 Misfire is an incredibly fun deluxe with a lot of play value, two great modes, and passable accessories. I find him to be a lot of fun to play with, I’m constantly transforming him back and forth, and his overall look is great. I’m sure I’m not alone in wishing that he had a more modern IDW style head, with separate optics, but it’s still awesome to see this Targetmaster turned Scavenger represented in the current toy line. This one is absolutely a recommended pickup from me. 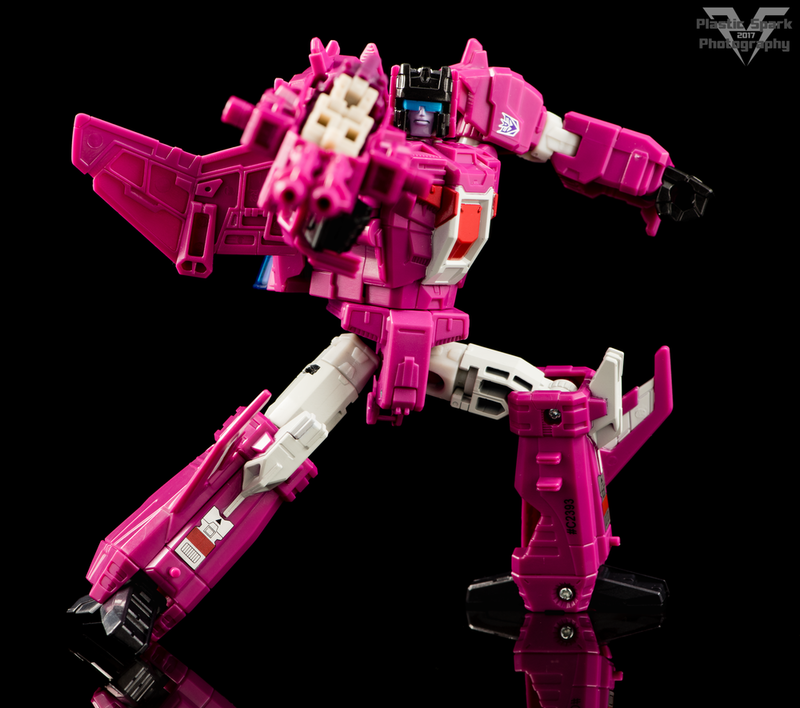 Thank you for checking out this review, and my photos of Titans Return Misfire! Don’t forget to check us out on Facebook as well! If you have any questions, comments, or requests please feel free to leave them below, comment or message me on the Facebook page, or email me at plasticsparkphotography@gmail.com!